When Sam Falle joined the Royal Navy and fell in love with a Danish girl in the 1930s, his life was plain sailing. But then his ship was sunk during World War II by the Japanese Navy, who rescued him and treated him on board with great chivalry. Thereafter he became a Japanese prisoner-of-war. Finally released at the end of the war and awarded the DSC for Gallantry, he married his Danish girl and embarked on a diplomatic career. By inclination a linguist and a traveler, he thrived on journeying to all parts of the globe. Critical and controversial, My Lucky Life includes an account of what happened when the author was thrown out of Iran, and when he was caught by revolution in Iraq. There are fascinating glimpses of royal visits, and backstreet meetings with terrorists; of peaceful family days interrupted by distant crises. 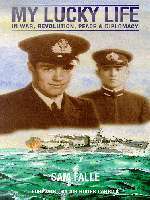 With great modesty Sir Sam Falle shares his remarkable life in this exhilarating account of life in the Royal Navy and in Diplomatic Service.